Random And Some: "Did you think this book was funny? Why or why not?" "Did you think this book was funny? Why or why not?" 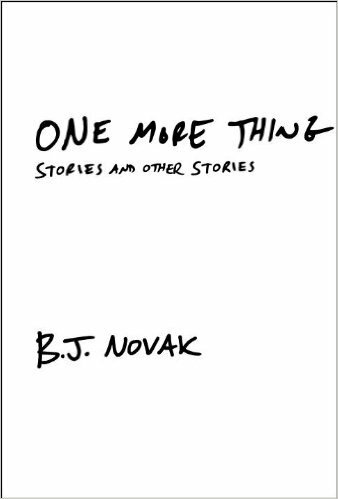 I recently read One More Thing: Stories and Other Stories (2014) by American actor, comedian, screenwriter and director B.J. Novak. You probably know him as Ryan 'The Temp' Howard from The Office or Smithson 'The Litte Man' Utivic from Inglorious Basterds. Talk about range. I stumbled upon his book via Buzzfeed's 35 Hilarious Books Guaranteed To Make You Laugh Out Loud listicle, in the wonderful company The Hitchhiker's Guide to the Galaxy, Tina Fey's Bossypants and Catch-22, which I all enjoyed, so naturally I had to read it. How else would I find out what happened to the boy who wins a $100,000 prize in a cereal box? One More Thing is a collection of 62 fun and funny stories. In them, Novak displays a wide variety of subjects, themes, tones and narrative voices to introduce some hilarious/insightful/provocative/moving premises. One of them being a boy who wins $100,000 in a box of Frosted Flakes, only to have his winnings unravel his family. We also meet a vengeance-minded hare, hell-bent on scoring a rematch against the tortoise who ruined his life. We also join John Grisham as he contemplates a monumental typo. The fun of reading One More Thing is how Novak catches you off-guard from one story to the next. I really enjoyed Novak's writing. It was entertaining and sensitive, with love, fear, family, ambition and man's search for "completeness" front and center. With all his stories sharing the same playful humor and inquisitiveness, Novak's trademark style, One More Thing is an entertaining read all the way through.